Paul was previously with us on Episode 67, Episode 78, and most recently with a piece of nonfiction on Episode 91. We are pleased to welcome him back to the show. Paul Rousseau is a physician and writer, mainly published in medical journals but making inroads into non medical publications. Never a novelist, just an essayist with an occasional poem. He is a devout dog lover, and partner to his three dogs. Happy Halloween, No Extra Words style! Caught by cops will never feel the same after you’ve had a little “Night Vision.” By Michael Anthony, copyright 2017, used with permission. Read Michael’s bio. For our segment today, Part 2 of my NaNoWriMo prep journey. 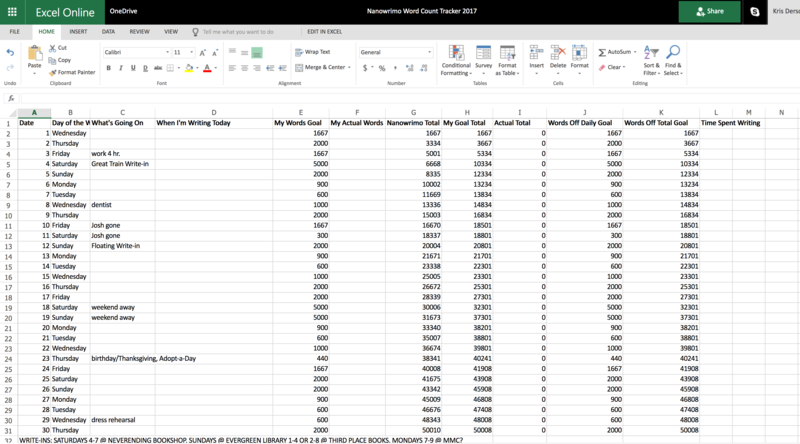 Click here to see the spreadsheet I’ve created to help me track my word goals. You probably wouldn’t want your significant other to try “The Experiment” on you. By T.E. Cowell, copyright 2015, used with permission. Previously published in Eunoia Review, 2015. Read T.E.’s bio. Michael Anthony is a writer and artist living in New Jersey. He has published fiction, poetry, and illustrations in literary journals and commercial magazines. Most recently these include L’Éphémère Review, Second Hand Stories Podcast, Route 7 Review, The Write Place At The Write Time, Scarlet Leaf Review, and Bull & Cross. The American Labor Museum exhibited Michael’s photojournalism essay on the waning of the textile industry. T. E. Cowell lives in Washington state. We’re showing where all the broken pieces are. Carefully prepping which face we show the world in “Kintsugi.” By Jaclyn Tan, copyright 2017, used with permission. Visit Jaclyn’s website. New segment! I talk all about my NaNoWriMo prep. Learn all about NaNoWriMo and be my writing buddy. With love sent to our friends in Vegas, we survive a long night “All the Hard Ways.” By Dan Hernandez, copyright 2015, used with permission. Visit Dan’s website. Jaclyn is a 19 year old student in Singapore who loves extended metaphors. She has previously contributed to No Extra Words, as well as the Teen Tuesdays feature of Cahoodaloodaling, a collaborative publication. She can be found at www.jaclynspeakswords.wordpress.com. Dan Hernandez lives in Las Vegas. His fiction has appeared in Carve, The Offing, and Day One. His nonfiction has been published by The Guardian, Vice, The New York Times, and other publications. He won the 2015 Richard J. Margolis Award as a “promising new writer” and has an MFA from the University of Nevada-Las Vegas, where he teaches and is managing editor of the lit journal Witness. Follow him on twitter at @danielgene.